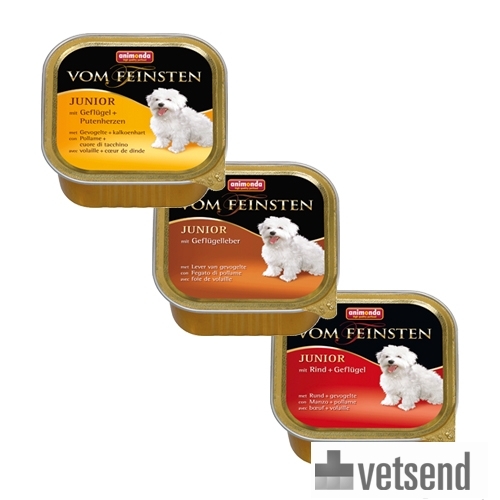 Animonda vom Feinsten Junior is wet food served in tubs. For puppies from 5 weeks and young, growing dogs. Animonda vom Feinsten Puppy food is specially tailored to meet the nutritional needs of young dogs and puppies. It contains more energy, minerals and vitamins for a healthy start in life. Beef & Poultry: Meat and meat derivatives (30% beef, 10% poultry), minerals. Poultry & Turkey Heart: Meat and meat derivatives (20% poultry, 8% turkey heart), minerals. Poultry Liver: Meat and meat derivatives (15% poultry liver), minerals. Have you used Animonda vom Feinsten Junior before? Let us know what you think about this product.